Leaders and children need to sign up annually. Do not pay any dues or fees until you have been to a meeting to learn about us. First, we have put together a FAQ list for parents that covers a lot of the most common questions. Additionally, we highly encourage you to read over our New Parent Guidebook, which has tons of info and resources for parents new and old! All participants in any capacity, adult or youth, must have a Medical Release & Liability Waiver form. This is required to participate in any activities with the group and must be completed each academic school year. Those forms are available on our website under “Forms”. Scan/email these to us in advance or give them to your child’s Leader at the next meeting. Complete the group Registration Form, which is available under “Forms” on the website as well. All children participating must have a form filled out, as well as all adults who will be attending on a regular basis or going on any campouts. Please fill out the forms and bring them to the next meeting. Note: We aim to ensure that cost is never a barrier for any family to join. If cost is an issue, we highly encourage you to reach out to the GSM or Auxiliary Chair about fee reductions and/or waivers. Please pay the annual registration fee – it is $45 for a single scout or $60 for a family. 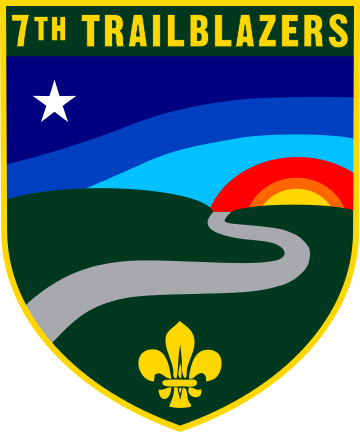 This covers our annual Group Charter, insurance premiums, scout registration with BPSA-US (our national organization), background checks for adults, the 7th Trailblazer shoulder patch and WFIS patch. Please pay the monthly dues, which is $10 for a single scout or $20 for a family. This covers meeting supplies costs and proficiency badges and necker (when earned). These can be paid on a monthly basis or annually in advance. Both monthly dues and registration fees can be paid by check or credit card at meetings or online on our website (preferred method). There may be other activity costs during the year for outings like campouts. All scouts should have uniform shirt and hat that they wear to all meetings (as well as a necker one they have earned it). That said, scouts do not need a uniform to start attending meetings. Adults may wear the official green BPSA logo t-shirt if they so desire. The group Quartermaster (Miguel Flores) will have a supply of shirts and caps for Chipmunks, Otters and Timberwolves. Due to cost and variety of sizes needed, Pathfinder and Rover shirts and hats are purchased on an as-needed basis. These can be found on the national website under Resources > BPSA Program. We are an independent scouting movement so parents do have some responsibility to ensure we have a quality, safe program. Scouting is a game. Let’s get ready for fun! Want weekly newsletters delivered right to your email box? Subscribe now and let the information flow. The best way to get ahold of us is through our Contact Us web form. This form is distributed to multiple leaders in our group. The Next Event Is . . .